If Thursday (day 6) was a gorgeous day of sailing, the night that followed was even more spectacular! The spinnaker charged ahead and the rest followed. We were doing between 6 and 7 knots, without the influence of current, in 13 knots of wind. The sky was clear and sparkling with stars. While I watched the illuminated crests of the waves, the Southern Cross watched me. There were no squalls, no ships and no interruptions. After five nights of “always something” to break the spell of continuity and our time in bed, whether it be a squall, turning the engines on or adjusting the sails, this night Mark and I experienced our dedicated three hours on watch and three hours off, and appreciated every minute of it. That 24 hour period on the ocean came as close to perfection for me as a sail trip can be. While during the day the atmosphere on Irie is pretty relaxed, with us wearing our undies (the warm clothes and comforter have “long” been put away again), going wherever we please and doing whatever we feel for (sea state permitting), taking turns at the helm, adjusting sails and keeping an eye on the instruments, the nights are a different ball game. When darkness falls and visibility disappears, when one of us left downstairs for some needed sleep, when all has been prepared for 12 hours of monotony and solitude, all our senses are on high alert and our concentration sharpens, until we get too tired. Things happen and they most likely happen at night, when our attention fades. Therefore, we have the following “rules of the night” on Irie: always wear a life jacket, always be strapped to the boat with a tether – to the helm seat while in the cockpit or to the rigged up jack lines while on deck, always have the other person around when needing to go on deck and always wake up the other person when there is a squall or boat approaching, when the sails need serious adjusting or when you are in doubt about something. We both don’t really like rules, but these ones we adamantly stick to. Day 7 started with a visible sunrise and soon the blue sky followed. It was 7:00 and I had a smile on my face. We had made great progress overnight and at this rate, we could make our destination before dark! Today! 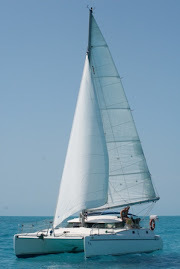 The “only” requirement was to keep up an average speed of 6.6 knots. Quite the challenge, sailing along the equator. The stress was back and the mellowness of the previous week gone. The race was on… Not for very long. Around 9:00 the wind speed dropped down to 8 knots and we moved at about 5. Where is that westerly current? It is easy to slow a boat down, but how do you speed it up? Decision time again. We had two choices: use an engine to give the boat the push it needed to pull into the harbor before 18:00 (stupid us forgot that we gained an hour underway and had until “our” 18:30 until the sun set), or slow the boat down, way down, to about 2 knots for an uncomfortable and rolly 23 hours, so we could arrive when there was enough light out again the next morning. Entering the unknown bay (to us) of San Cristobal in the dark was not an option. We opted for an engine/spinnaker combo. The sun shower was empty, the prepared meals devoured. The boat was getting dirty and our small garbage bag full. The idea of a whole night’s sleep beckoned. We really enjoyed this first long voyage – and are looking forward to the 3000-mile trip to French Polynesia! - and Irie behaved like a good little boat. Only three issues appeared on a 7-day ocean passage, which is great, knowing that we sometimes have three things a day break or fail! A small rip in the spinnaker (on which we put sail tape immediately after noticing), a leaking salt water pump in the starboard engine and a chafe spot on our dinghy from a rubbing solar panel during the windy nights need to be taken care of. I wrote an excellent book with entertaining and capturing chapters, many funny blog entries, engaging columns and stories people would love. In my head. This is what I do non-stop while being on the water and staring at the sea. Being creative in vain. “Head writing” is my biggest form of entertainment and occupation. Unfortunately, these perfect phrases and revealing thoughts will never be put on paper or find their way to the – no doubt - captivated reader. My head was spinning, my brain was full, Mark and I were tired. It was time to arrive… in the Galapagos Islands! With our own house. Very well done. I thoroughly enjoy reading your blogs.